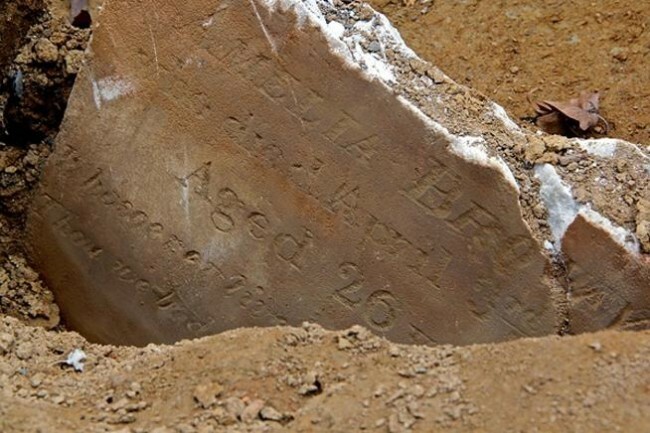 Eleven-year-old Anna Maria Bolden died this date, November 27th, in 1852 and was buried at Bethel Burying Ground. Eleven-year-old Mary Ann Bolden died this date, November 27th, in 1853 of Typhoid Fever and was buried at Bethel Burying Ground. She was the daughter of Joseph and Mary Ann Bolden. He was twenty-five years old at the time of his child’s death. Ms. Bolden was thirty-one. Both were born in Maryland. Mr. Bolden worked as a porter sporadically which was problematical since Ms. Bolden was physically unable to work. Charitable organizations donated firewood and “some groceries” to the family, according to the 1847 Philadelphia African American Census. The Boldens had two other children, Levi, who was seven-years-old at the time of his sister’s death and Joseph who was four-years-old, according to the 1850 U.S. Census. Ms. Bolden would give birth to a stillborn child in 1854 who was buried at Lebanon Cemetery. The Bolden home (red pin above) was in Atkinson’s Court that opened on to Lombard Street between 5th and 6th Streets. Atkinson’s Court (red arrows) was located between two important Black churches: Bethel AME Church (yellow arrow) and Wesley AMEZ (black arrow). The Bolden family lived in one room at #1 Atkinson’s Court for which they paid $2.50 a month in rent, according to the 1847 Philadelphia African American Census. This overcrowded block-wide 10-foot wide lane was home to twenty poor Black families, totaling seventy-five member. The sun never shone in the dark rooms on the alley, making it a haven for respiratory diseases, especially Tuberculosis. For all the residents, there was only one hydrant/spigot for water to supply the block with questionable clean water. In the same building as the Boldens, there was a family of eight adults and children living in one room. Six of the eight were formerly enslaved, according to the 1847 Census. The Boldens buried their daughter on a day that started out cloudy with the temperature at 47 degrees at sunrise. The afternoon saw the skies clear with the temperature falling to 42 degrees by two o’clock. ← The seven-day-old son of Mary Ann Reed died this date, November 22nd, in 1843 and was buried at Bethel Burying Ground.